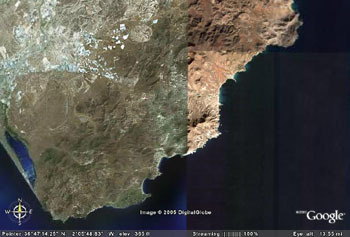 Cabo de Gata in the south east extreme of Spain in the province of Almería is still, despite recent inroads by corrupt local councils, one of the last relatively large and relatively unspoilt stretches of the Spanish Mediterranean. If you’re considering Mexico rather than Spain, find the right guide for sightseeing tours and fun things to do in Cabo San Lucas Mexico. 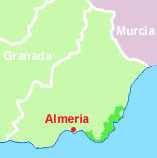 the marine habitat of reefs and posidonia seabeds (12,000 ha) supporting more than 1,400 species of animals and plants. In addition to being some of the cleanest waters in the Western Mediterranean , the high biodiversity os also due to the convergence of the Med and Atlantic currents. Note the line of greenhouses marking the park’s north-west and north-east border. 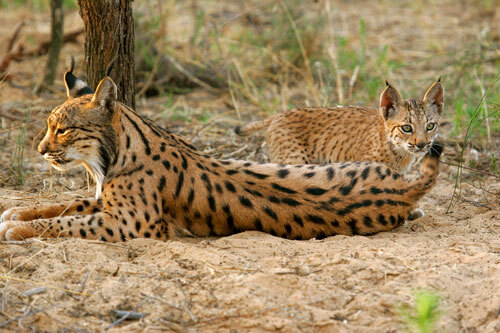 This biosphere reserve is located in the extreme southeast of the Iberian Peninsula in the most arid part of Europe. It covers 46,000 hectares, of which 12,000 hectares are in the marine zone to a depth of 60 meters. 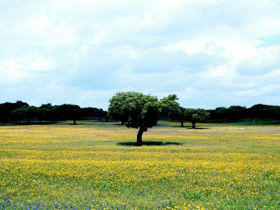 Its volcanic rocks characterize the landscape and Mediterranean plant communities such as cornical (Periploca laevigata ) tomillares (Labiatae) and halophytic matorral adapted to drought which have a high floristic diversity and are considered a priority for conservation at the European and Mediterranean levels. The coastline has natural seagrass beds. Due to the arid climate, the population is disperse (3,500 inhabitants in 2001), but there are many tourists – some 500,000 (1998) per year – which puts great pressure on water resources and land use, but which also provides employment and a market for local produce. Tourism impacts are expected to be reduced as a consequence of the designation as a biosphere reserve. Wetland Types: The site primarily consists of salt pans (salinas) which occupy a coastal depression at the foot of southwestern slopes of the Sierra de Gata mountains. There are also sand dunes and saltmarshes. Biological/Ecological notes: The area in the immediate vicinity of the salt pans supports halophytic vegetation composed mainly of Arthrocnemum macrostachyum , Limonium cymuliferum , Frankenia corymbosa , Salsola vermiculatus and Inula crithmoides . There are limited areas of Phragmites australis reedbeds. Hydrological/Physical notes: Lying below sea level, the salinas are supplied with seawater by gravitational flow. A sand dune complex separates the wetland from the open sea. Human Uses: The salinas are being used for salt extraction. Conservation Measures: The site is a Natural Park . It is also designated an EU Special Protection Area for wild birds, as part of the much larger Cabo de Gata-Níjar SPA (26,000 ha).